William Nicholson is an Academy Award nominated screenwriter (Nell, Gladiator) as well as an award-winning fantasy author and playwright. Rich and Mad is his first young adult novel. At first glance, it sounds like the simplest of stories, the story that has been told and retold since forever—young love. 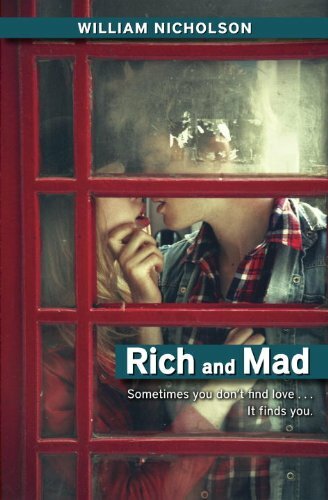 Rich and Mad (short for Maddie), both age sixteen, have decided they want to be in love, just not with each other. They come to their separate epiphanies and decide to take the plunge and open themselves to their hearts desires. Whether the object of each of their affections is prepared to reciprocate those loving feelings is another matter. This is the tale of their saga to find out and discover what love is. Rich is the one of the “odd ones out” at school. He marches to his own beat, and confidently so. He doesn’t even own a cell phone. If you want to talk to him, come find him. Maddie is a typical teen girl trying to parse and read the signals of male attention, hoping and praying it means what she thinks it does. Rich and Mad is a relatively quiet read, but there’s intensity and depth to the story that goes far deeper than its apparently simple premise would presume. Nicholson has an amazing ability to evoke not only a teen girl’s voice, but also the sensibility, and the layers of fear, concerns, and search for identity so common at the adolescent stage of life. Nicholson’s portrayal of Rich is an abundant, full-bodied depiction of a boy not caught up in the trends of the day, not even drawn to them, but his self-doubt is still clear; and his search for meaning, in life and in love, resonates soundly. The author makes a subtle use of psychology through the character’s use of reading material. This device is delightful in its originality, and it’s cleverly woven into the story. It gives the reader as much opportunity as the characters to consider these issues in ways perhaps never done before. There is a description of sexual activity that is forthright and graphic, more so than in any other young adult book this reviewer has encountered. Because of the no-holds-barred portrayal, some may feel it’s salacious. This reader believes it is what it is: real. Rich and Mad is William Nicholson’s first foray into the young adult genre. I certainly hope it isn’t his last.